Like many music bloggers, I recently posted my top 10 songs of the year. Being a music fan, of course I had to check out the other lists from around the internet. After exhaustively going through the lists of my favorite music blogs, I have found 5 more songs which are worth checking out. Stepdad is an electronic pop band from Michigan who have released an EP and this is the lead single from the album. I love this kind of music, and what's great is the rest of the album is just as good. They remind me of a happy version of The Bloodhound Gang. Here is the video for their song. Note: it is a very strange video, so you might want to just listen to the song. Dragonette is a cool Canadian band with an electronic sound and pop likeability. They have a nice female lead singer and good songwriting. I have heard several good songs from them so far and this one is my favorite. I would definitely keep them on my radar. Clams Casino is a new innovative hip hop producer from New Jersey. With so many beats sounding the same these days, Clams is really stretching the boundaries by producing atmospheric beats that are at times even better without vocals over them. Here is one of his instrumental hits called I'm God. Azealia Banks is like a cross between Nicki Manaj and Santigold. In this song she comes through with 4 distinct vocal styles over a pumping house beat produced by Lazy Jay. The vocals are equally dirty as they are brilliant. Expect big things from her in the near future. Danny Banks has an intense raw rap style which really stands out over the seas of rappers out there these days. His personal style and outlook on the hip hop scene is different as well. Monopoly has a bunch of punchlines over an electronic buzzing beat. Get this one for free off his new album. One of my favorite things to do each day is check my subscriptions feed on Youtube for new videos that have been posted. The combination of Youtube plus the subscriptions feature is a great because it lets you keep track of your favorite Youtubers and get notifications about the new videos they upload. I follow over 100 different channels and in this post I share my top 10 picks for 2011. These channels were active in 2011 and produced high quality content. For this list, I tried to stay away from the super popular channels that everyone knows about so if you are wondering why some of those are not on here, that is the reason. Jesse and Jeana from BFvsGF and PrankvsPrank have had a huge year and that is why they are number 1 on the list. They are a couple from the New Jersey/Philadelphia area who play pranks on each other and vlog their daily lives for us to watch each day. They are fun, entertaining, and have a loving relationship. This is one of my favorite pranks where Jeana messes with Jesse using a universal remote. Mark and Todd from Barely Political are the multi-talented duo behind the Key of Awesome music video parodies, puppet sketches, and various other comedic videos. They are masters of creating different characters and constructing laugh out loud worthy videos. In this sketch, they have to decide on who should be fired from the team. Simple Pickup consists of 3 guys who go out in public and try to pick up girls using a variety of odd tactics such as using quotes, dressing in costume, and behaving in an unconventional manner. This channel is as much entertaining as it is educational. Their videos will amaze you and make you laugh at the same time. Here is the first one they did where they used internet references to pick up girls. I have mentioned BLR several times over the past year because I have become a huge fan. In case you've never heard of them, Bad Lip Reading is a channel that takes music videos and completely turns them into new songs with different music and vocals. The results are remarkably good as original songs are created in the process. Their talent even earned them a spot in my 10 Best Songs of the Year list. In this video, Justin Bieber and the guy from Rascal Flatts sing passionately about jumping beans. Greg Benson from Mediocre Films has been around for a while, but recently he has put out some of the most hilarious and groundbreaking videos earning him a well deserved spot in the top 10 Youtube channels list. He does pranks, interviews, and the occasional music video, all which are likely to make you laugh. In this video, Greg takes a simple idea such as pointing and uses it to prank people on the street. Tony Wine is part creepy, part innovative, and part comedy genius. He is sort of like a dark horse in the Youtube scene, yet his talent is undeniable and you will be giggling at his videos even if you know it is wrong. Here's one where he tells a story about an awkward interaction he had with a stranger. Melissa Villasenor gained attention this year with her impressions act on the show America’s Got Talent. She was great on that show, and lucky for us, she has a Youtube channel where she posts her videos doing celebrity impressions and original characters. Here's a reel where she does 21 different impressions. Hannah Hart is a lovable young woman who is known for her Youtube series "My Drunk Kitchen" where she haphazardly cooks a dish while getting drunk in the process. While the food may not always turn out well, the video always do. Here's a music video she made with Andrew from Songs to Wear Pants To. I just recently discovered this sketch comedy group and while their channel is new, the makers of the videos have been doing their thing for a while and it shows. With just a couple videos released so far, both hilarious, this is definitely one of the channels to keep on your radar for the next year. In this video, a husband loses his cool when his wife makes him guess too much. Dave and Ethan are a comedy duo who make videos where they interact with other people either by dating or interviewing. They also tour the country and perform comedy bits for live audiences. In this video, they go on the subway and try to pick up girls with a variety of tactics and pickup lines. If you liked these videos, please leave a comment below. What are some of your favorite Youtube channels? Check out my previous top 10 Youtube channel list with some different channels and videos here. To see the 10 Best Youtube Channels for 2012 go here. - No artist repeats throughout the list. - Song does not have to be released in 2011, it could be the year before. - Omission of super popular songs. Outasight is a singer/rapper who broke into mainstream this year with his hit Tonight is the Night which was featured in a Pepsi commercial. This song has all the makings of a "song of the year" including good production, catchiness, and overall likeability. 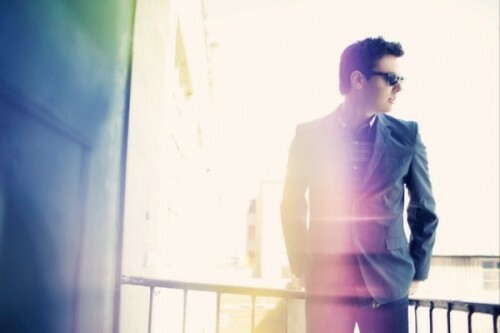 Outasight's music is a fresh mix of funk, pop, and hip hop. If you like these styles, be sure to look him up as he has a bunch of other great songs. Demi Lavato comes in at number 2 with this emotional well written song called Skyscraper. In this song she has been broken down by a relationship, but is rising back like a skyscraper as the lyrics suggest. This is one of those songs you can really feel. It's the kind of song that can give you chills. Independent singer songwriter Meghan Tonjes has had a huge year. Gaining popularity from doing cover songs on Youtube, she has made a name for herself and has even released orginal songs such as this one called This Year. It's an inspirational song that predict how this year is going to be a good one. The message in this song certainly came true for her. The Grates are one of my new favorite bands of the year. They are currently a 2 piece (former 3 piece) band from Australia who make fun, catchy indie rock songs. This song, Carve Your Name, is not from their newest album, but it is my favorite song from them. Their lead single from this year, Turn Me On, is also worth checking out. I don't know what is it about Matisyahu, but the guy really knows how to make a hit song. This one called Miracle debuted late last year. It is powerful, uplifting, and has a great beat. Matisyahu is on a hot streak having had his song One Day featured on last year's 10 Best list. Bad Lip Reading is a mysterious Youtube artist who takes other music video and creates completely original music and vocals to go with them by over dubbing the lyrics. This idea is innovative as is, but when you realize that these songs are professional quality and actually better than the original songs, that's when you know you have something special. Here's is my favorite of the year from them called Rockin' All Night Long where they used a Taylor Swift video and really made it a bangin' song. I found this one early in the year and while it is not from 2011, it was so good that I had to feature it in my top 10 songs of the year. I'm not a huge Alicia Keys fan, but this song really struck a chord with me. I love the instrumental and the vocals go perfectly with it. Like the previous song, I am not a fan of Nicki Minaj, but the collaboration here with producer Swizz Beatz really made this song a stand out. The structure and beat are very different from most songs you hear these days. It has several different elements from rap, to singing, to spacy vocals. Catch Me is an emotional song with a beat that stays interesting even after multiple listens. I found this song through a Youtube video where a guy named Phil had it playing in his headphones while he danced around the subway among unsuspecting passengers. Get Outta My Way is a catchy dance pop song with loops and layers that will get stuck in your head if you are not careful. It was tough to round out this list, but after much deliberation, I selected this song by a New York electronic band called Small Black. The song Moon Killer has a sweeping instrumental and wondrous vocals that fill out the track and make it dreamlike. Enjoy! If you liked the songs on this list, be sure to leave a comment below! Check out last years list: Top 11 Songs of 2010. Also check out the Ten Best Songs of 2012. I'm getting excited for my top 10 songs of 2011 blog which will be posted in a couple of weeks, but until then, I thought I would share 3 songs that you should check out in the mean time. First up is a song called Moon Killer by a group called Small Black. I don't know too much about the group. I found this song while browsing some music blogs. The song has a dreamy electronic sound with vocals to match. Have a listen. Next is a new song by Avicii and Nicky Romero. Apparently it is a leak and hasn't officially been named yet, but it does use a sample by Justice from the song D.A.N.C.E.. The song is much of what you would expect from Avicii with a danceable beat and catchy melodies. Try not to get this one stuck in your head ofter 1 listen. Avicii and Nicky Romero - D.A.N.C.E.? Lastly is a song by a rapper named Skizzy Mars called Tara. While I don't really care for the rapper himself, the instrumental is great with samples from Gwen Stefani. Not too much else to say, so enjoy! The Nielson ratings system needs to be abolished. If you don't know what it is, it is an ancient system of tracking what a small percentage of the country is watching on tv. These ratings are then used to decide which shows will be kept on the air and which ones will be canceled. The problem is, they are not working. Good shows are constantly getting canceled and bad shows are constantly being kept on the air. I'm convinced these Nielson ratings are incredibly inaccurate to what people are actually watching. If we are going to base so much on ratings, it needs to be a much better system. Every viewer must be accounted for, not just a tiny percentage of "Nielson Families". Does anyone even know someone who participates in these ratings? I sure don't. 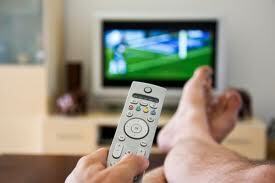 All shows watched need to be accounted for and in all formats including online, recorded, mobile etc. I am tired of seeing great shows getting canceled because of low Nielson ratings. Why has this system not been updated? There have been so many advancements in technology and yet the ratings system is still the same as it has been in the past. Come on tv industry. Something has to be done about this. I don't do a lot of cooking, but I do have a few dishes I make that I thought I would share with you. These meals are healthy and easy to make, not to mention, they are very affordable. Below you will find the ingredients, directions on how to make it, and a picture of how it looks when it's done. Ingredients: Instant Brown Rice (Uncle Bens), Black Beans (Bush's), Green Giant Frozen Mixed Vegetables (Broccoli and Peppers) in the box, Butter. Directions: Preparing this is very easy. Cook the rice according to the box. It takes about 10 minutes. Cook the veggies in the microwave from a couple minutes. Warm up the beans in the microwave for about 20 seconds. Put some butter on the rice and then mix everything together on the plate. You can decide on the amounts of each depending on your serving size. The cost for the meal is under $2. 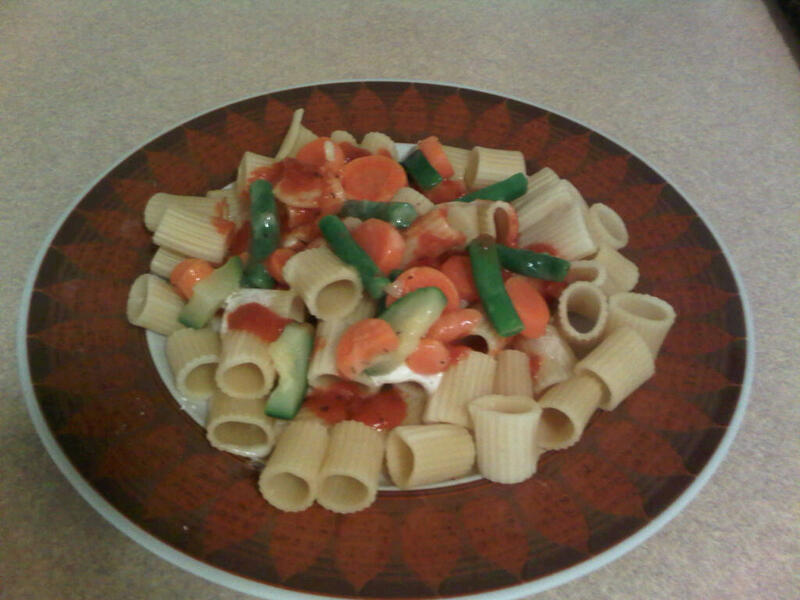 Ingredients: Pasta (Barilla Mezzi Rigatoni), Marinara Sauce (Rinaldi No Salt Added), Green Giant Mixed Vegetables (Carrot, Cucumber, Green Beans) in the box, Butter. Directions: This one is similar to the previous dish except it is pasta instead of rice. Cook the pasta according to the directions on the box. Cook the vegetables in the microwave for a couple minutes. Put the pasta on the plate, add some butter, and put the vegetables on top, and you are ready to go! Like the rice dish, this one cost less than $2 for the meal. Tips: I usually get at least 2 meals out of each preparation, and 2 preparations for each box of pasta and rice, so it comes out to about 4 meals per box. You can substitute different ingredients and brands, for example, using a different rice or pasta, or a different kind of vegetable. For health tips, I recommend not using a lot of butter to keep the saturated fat down. Also for the sauce, look for low sodium varieties to keep the sodium content down. 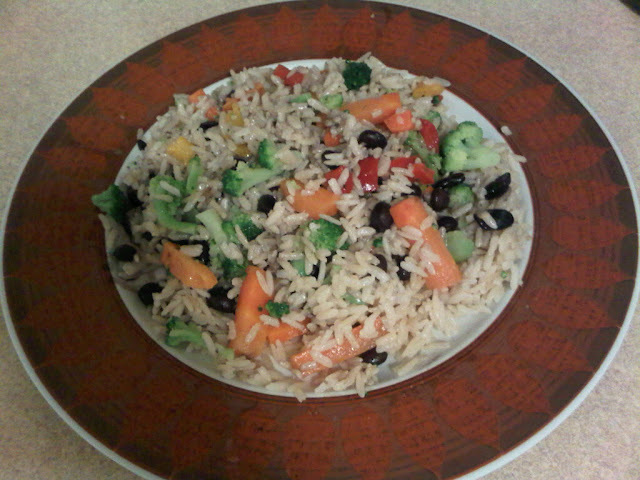 I hope you like these quick, healthy, economical recipes. If you try them, let me know what you think!